The Missing Puzzle Piece to My Training! How sure are we that Stretching Your Boundaries (paperback) will work for you? Simply fill out the form below and put Stretching Your Boundaries (paperback) to work for you right now. Obviously, we would go out of business if Stretching Your Boundaries (paperback) didn't work, the way we said, right? With the promise of a full refund if you're unsatisfied, you have nothing to lose by trying Stretching Your Boundaries (paperback). Go ahead and try it today. Picture yourself with the elegant lines and eye-catching flexibility of a Himalayan Yogi. Watch yourself move with the fluidity and grace of a great dancer. Feel your strength as you power into and hold the most challenging of bodyweight exercise moves. See yourself ripple with the muscular, toned, symmetrical physique that signals the perfect marriage of form and function. All of this could be yours—with the right mindset, the right knowledge, the right mentor and the right blueprint for success. Enter Al Kavadlo books. 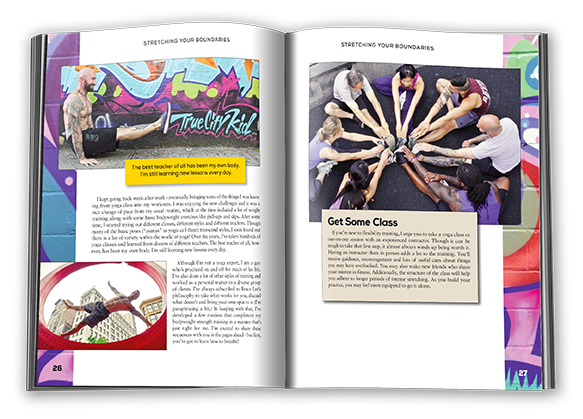 His hard-earned skills in the world of bodyweight exercise training are displayed through his words. This is a man who walks the walk of his talk—and then some. A man who models the capabilities and qualities of a bodyweight master—while also being able to teach and inspire others in the most practical of manners. In Stretching Your Boundaries, Al provides a blueprint that anyone can follow to achieve supreme physical elegance, mobility and strength—and to amp up their game in any aspect of physical performance. Stretching Your Boundaries could have been called "Yoga Meets Calisthenics". Or "Zen and the Art of Stretch". Because—as with the best of the physical culturists—there is a deep, yet lightly-carried spiritual "vibe" to Al’s teachings. There is a humble joy and a sense of well-being emanating from the man—that speaks volumes about his program. If you really want to succeed as a physical culturist—and if you really want to live a healthy, happy, long life—then the right combination of spirit, wisdom and hard, skilled practice is the essential recipe, or template if you will. In Stretching Your Boundaries you will find the time-tested tools you need to continue cultivating yourself as a magnificent human artwork. Fitting Al Kavadlo’s message is the medium: the book has gorgeous design and stunning photography—that will inspire you for years to come. Rated 10/10 The Missing Puzzle Piece to My Training! 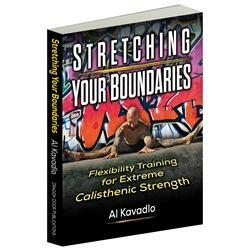 Al Kavadlo has done an incredible job with Stretching Your Boundaries. 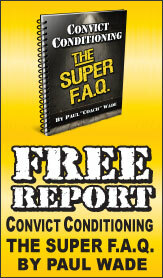 He's presented a very practical (and relevant to your strength and calisthenics training) approach. He's cut through the mumbo jumbo that sometimes surrounds flexibility training and in his signature way, has made it all fun again too. I know that I have some flexibility issues holding back my full strength potential, but now I know what to do, when to do it, and why. As with Al Kavadlo's previous books, there are lots of informative (and entertaining) photos with people of varying body types. 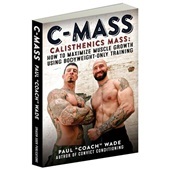 The in-depth explanations of each move and the calisthenics moves that they correspond with was very helpful—not only for understanding, but as a continued help for programming and troubleshooting. Looking forward to adding a lot of this to my practice and breaking through more than a few plateaus! If you've read any of Al's books before, you'll know what to expect. If you haven't well here it is. Expect an amazing amount of information, presented in a totally accessible and non intimidating way aimed at any level of gym user, bodyweight athlete, or fitness enthusiast. The presentation couldn't be clearer in this book and includes sample routines for different parts of the body to give them a full stretch and manipulation. The book is divided into 3 sections. Section 1: The Stretch Manifesto. This section clearly outlines the theory of stretching, the history, and why we do the stretches we do, and how the body best reacts to different styles of stretches. This is no short section and provides a welcome explanation of what we can do to best improve the efficiency of the time we spend stretching. This section compiles several different stretches for different parts of the body so you can immediately get to work on your specific problem area. All in all this a great resource for anyone with an active interest in exercise and mobility. It complements Al's other books, Raising The Bar, and Pushing The Limits perfectly, to be a very complete set of health and fitness manuals. I have been instructing martial arts for 8 years and conditioning training for 2 years, as I am getting older the original stretch routines that was doing did not work as well as they once did. After reading Al and Danny's other books it was clear to me that I was not doing enough for myself and my students in the art of stretching, Al's clear, concise and to the point philosophy opened the door for me to begin a better training regiment and to help the students reach their full potential. I recently got an email from fellow coach, and good friend, Al Kavadlo about his new book 'Stretching Your Boundaries' - a title devoted to helping you improve your flexibility, mobility and, ultimately, make you perform better with less pain. If you're like the vast majority of people out there then you probably don't do enough work on your flexibility so you should check out this book. At over 200 pages, the book covers the practice of stretching in good detail. But, where the book really shines is in its practical description of a large number of stretches. Not only does Al describe the stretches well but he explains Common Mistakes, Muscles Used, the exercise counterpart (i.e. do this stretch to get better at that exercise) and also breathing patterns. Few people understand the importance of correct breathing in flexibility training so this was a really nice addition. What I most enjoyed about 'Stretching Your Boundaries' was the exercise selection itself. I choose my exercises based on their function rather than what muscles they 'work' and the book approaches stretching in a similar fashion. What this ultimately means is that you have a stretching program that works rather than just spinning your wheels - and I'm all for that. I couldn't wait to get my hands on this book and when I finally did I was not disappointed! This book is absolutely incredible. 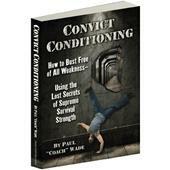 I have read a lot of books on stretching and this is one of the best. I especially love the multiple progressions and connections to bodyweight exercises. I highly recommend this to anybody looking to improve their bodyweight skills and overall flexibility. Great book, For the price give you so much value. It was what I needed for my excercise routine. I have recently bought Al's latest book on stretching and as usual he did not disappoint. I was looking for something to aid in my search for flexibility and this came at the perfect time. As a man that has struggled with flexibility my whole life Al has written an amazingly user friendly book for people like me but is able to push other more flexible peoples boundaries. It is also nice of an author to take the time to reply on social network sites. Not only reply but also reply in a timely fashion. Nothing but positives from on the book and Al! New job and thank you. Rated 10/10 Al Kavadlo does it again! 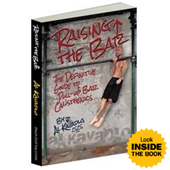 Firstly, this book is the perfect complement to Raising the Bar and Pushing the Limits. 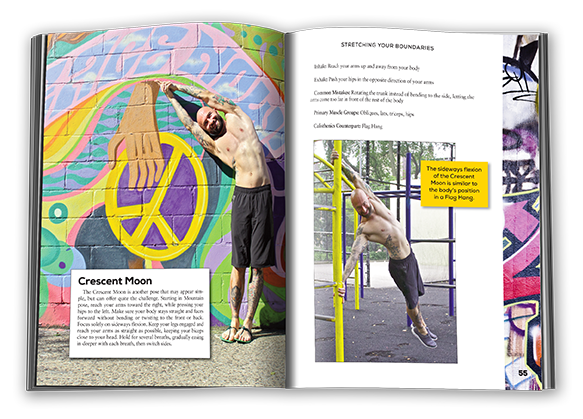 It does exactly what it promises: flexibility training for extreme calisthenics strength! However, this book also expands upon Al's philosophy behind training and its relation to the well being of the human body. Frankly, the knowledge presented in this book is very difficult to acquire on your own by just researching around the internet. 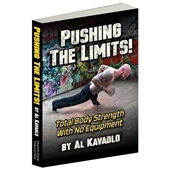 While you can go on YouTube and find some stretching demonstrations, Al Kavadlo has gone off of many years of experience in both fitness and spirituality, and brings a very organic and inclusive approach to writing this book. Furthermore, the photography and artwork are top-notch and very cool. Al's style shines through possibly even better than in his previous books! If you have an idea of how good this book *could* be, do not worry because it is everything you can expect and probably more! This book brings you the tools and inspiration to start progressing with your flexibility without a "nose up in the air" attitude. The author brings the info to you in a humble manner and appreciates the fact that not everyone is a natural born contortionist.